The 80km long "Etschradroute" cycling trail along the old Roman road Via Claudia Augusta is particularly popular among moderate cyclists. The way runs from Lake Resia in the North to the spa town of Meran/Merano. It runs through Burgusio/Burgeis with a view of the Marienberg Abbey, through Malles/Mals with its seven Romanesque churches, through the medieval town of Glorenza/Glurns and also past the ancient St. Proculus church in Naturno/Naturns with its pre-Carolingian frescos. With more than 48 hairpin bends on the South Tyrol side alone, the Stelvio Pass Road is among the most challenging – and beautiful – mountain courses in the whole world. The winding pass road is as impressive in terms of its scenery as it is challenging to ride. Every year, aspiring racing cyclists from all corners of the globe take on its many twists and turns. One of the most popular stretches crosses over Trafoi on the Stelvio Pass before taking the Umbrail Pass to head in the direction of Santa Maria and Müstair in Switzerland. Also popular among racing cyclists is the Monte Sole mountain scenic route and the stretch that crosses the Ofen Pass. Recommended tours for recreational cyclists and families lead to the Matsch Valley, the Val Martello or the Resia Lake with its half-sunken church tower. The challenging classical tour for racing bikes through the border triangle. 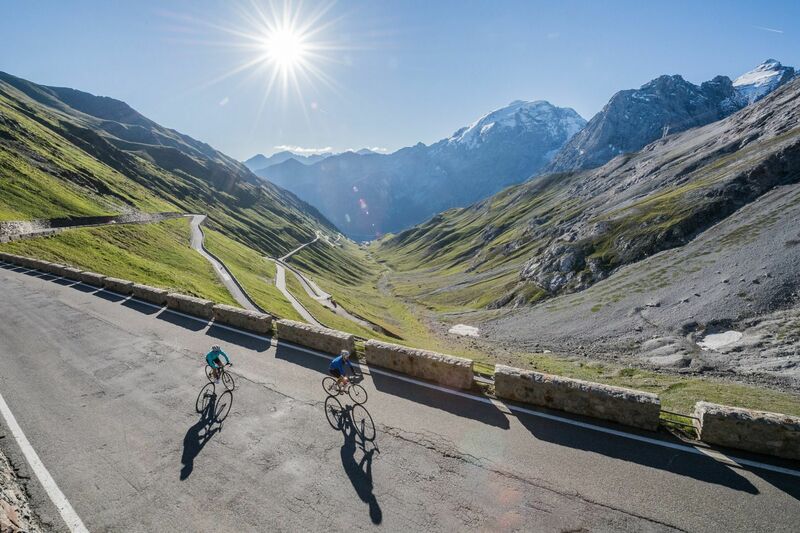 The ride from Prato/Prad to the Stelvio Pass is deemed a classic tour and challenge in the racing bike scene. As particularly appealing are deemed not only the 25 km and around ,1800 metres of height gain, which must be managed. Also the overall 48 turns leading up from Prato via Gomagoi, Trafoi and the Franzenshöhe to the second highest tarmaced mountain pass in Europe. Near Trafoi the unlimited view to the glacier and rock formations of the Ortler Group open up to the cyclist, right up to the top of the Stelvio Pass. At the highest point and at the same time the border triangle (2,757 m), you can relax and enjoy the panoramic view. The descent briefly leads through Italy and across the Umbrail Pass into Switzerland through the beautiful Münstertal Valley, past the world heritage site of St. Johann Abbey in Müstair. It is worth to stop, and ride back to Prato via Tubre/Taufers and Glorenza/Glurns. 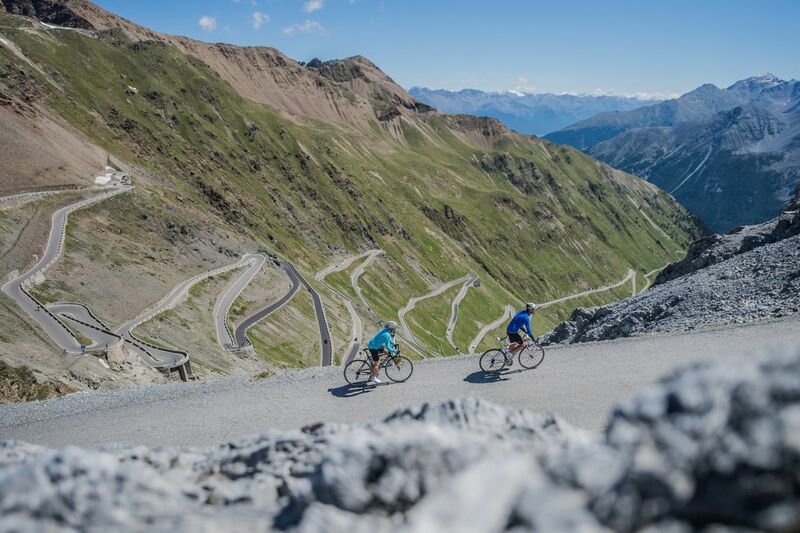 Tip: Stelvio Pass is a stage of the Giro d’Italia, coming from Bormio into Val Martello.